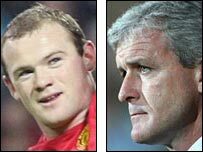 Manchester United's Wayne Rooney and Blackburn boss Mark Hughes have won the Premier League player and manager of the month awards for October. Rooney, 22, has been outstanding as champions United have moved into second place in the Premier League and reached the Champions League knockout phase. His award came on the day when it was revealed Rooney will be out of action for four weeks with an ankle injury. Hughes has been rewarded for Rovers' fine run to sixth place in the league.